Authors Nelson & Martin read an abridged version of their bestselling book, Growing Up Lutheran, in their natural Norwegian-American brogues. 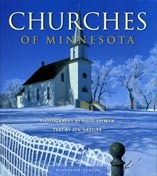 Chapters are introduced with excerpts from familiar Lutheran hymns. In other words, there are no hymns from the green hymnal or With One Voice. Truckers can shoot right across Kansas or Montana when they listen to this, and people in the hospital can shoot right through the day…unless they have had stitches. In the case of stitches, the authors recommend the book version. Why get sewn up again? The doctor has better things to do with his time, like finding a cure for hot flashes. NOTE: This is not a DVD or video. It is an audio-book reading on three compact discs (CDs); three hours (180 minutes).